1. This iPad Keyboard Case Special Design for both iPad Pro 9.7 inch(Model Number: A1673,A1674,A1675) and iPad Air 2(Model Number: A1566,A1567), will NOT fit for iPad Air/iPad Mini or any other iPad or tablets! Please check with your tablet's model clearly before ordering! 2. Sleep / Wake: Opening or closing iPad pro 9.7 cover trigger iPad sleep or wake modes. iPad pro 9.7 keyboard connects automatically (once paired via Bluetooth) 3. Built-in hinges allow the iPad pro 9.7 to be tilted up to 135 degrees to provide the most comfortable viewing position. Upgraded version, Stylish design, all around protection with a reliable Bluetooth connection. 4. High-quality ipad pro 9.7 protective case provides full-body protection to keep your iPad air 2 free from scratches, dust etc. The cut outs are very accurate. 5. Note: Due to iPad default setting, customer may get period when pressing Space key. Please follow the steps to fix it -goes to Setting - General - Keyboard - “.” Shortcut (turn it off). 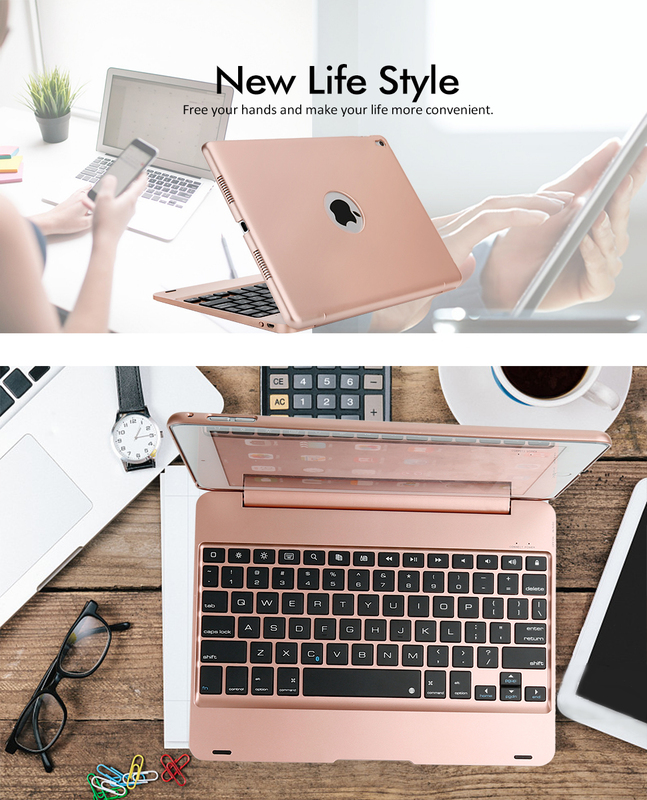 Specially design for the iPad Pro 9.7 and iPad Air 2, when you use this keyboard, it will change like MacBook, you can take it outside, let typing easier and protect your iPad.